Community banks are lagging behind in the digital world. In the past year, content marketing (social media, blogging, etc.) generated three times as many leads as traditional outbound marketing for businesses, and it costs 62% less. Yet community banks still spend seven times more on donations and community sponsorships than digital channels. It doesn’t make sense. There lies a huge opportunity for Banks to adopt a few powerful tools to dominate the web: opening up ways to attract millennial customers, business customers, and improve existing relationships. Here are three powerful community bank marketing methods that you can get started with today. Get your Bank on Social Media! There are now over 2.3 billion active social media users, while almost 80% of US residents have a social media profile. It’s no surprise that most of your customers are scrolling through Facebook and Twitter feeds on a daily basis. So why aren’t you using social media as a powerful tool to grow your community bank’s audience? Many businesses are experiencing huge increases in sales using social selling. This is likely because 55% of consumers and 70% of B2B purchase decision makers do their research using social media. More people than ever are using social media to influence their purchasing research, making your social presence increasingly valuable. A recent study found that 40% of businesses plan to spend more than 20% of their total advertising budgets on social media channels, while community banks are spending a majority of their marketing dollars on traditional outbound marketing tactics. Banks are seriously missing out by not utilizing the web to grow. It’s time for community banks to start investing in social media. 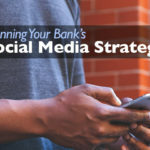 Read our article on planning your bank social media strategy to get started. 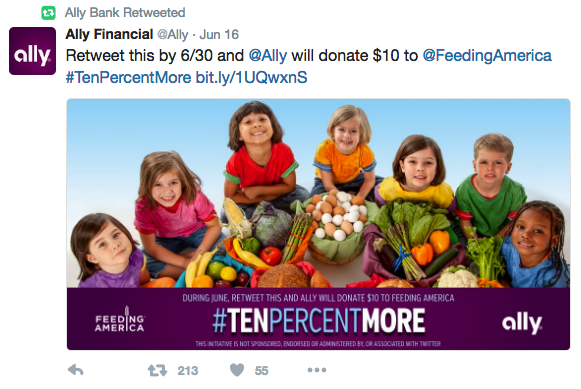 One bank that dominates social media is Ally. Each month, they publish over 1,500 pieces of content across social media. They post links to their blog content, share financial tips, talk about their social efforts, and announce updates to their customers. A quick scroll through Ally’s twitter feed shows their personal interactions with 24,000 followers, and tweets with genuinely helpful content. Ally also uses their Facebook page to re-post their blog material and to share information, enabling a greater audience of 168,000 people to benefit. 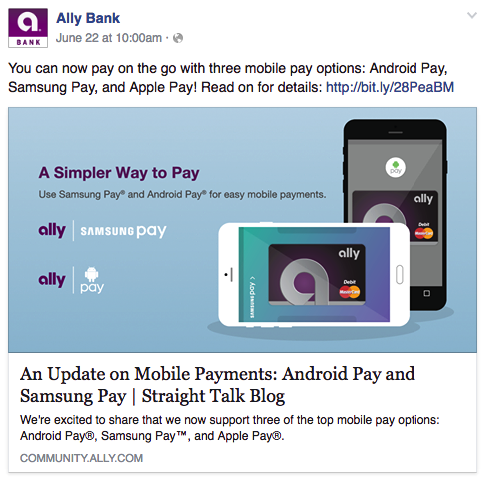 Although they are bigger than most community banks, Ally’s social presence serves as a great model for how you can get started at your bank. Publishing helpful and informational articles on your bank’s website drives traffic, establishes authority, builds trust with prospects and customers, and generates new leads. The Huffington Post reports that B2B marketers who regularly blog acquire 67% more leads than those who don’t. Blogging is a powerful online tool that is totally underutilized tool by banks. One of the driving forces behind community banks are the strong, personal relationships that are created. However, by 2020, customers will maintain 85% of their relationships without talking to a human. 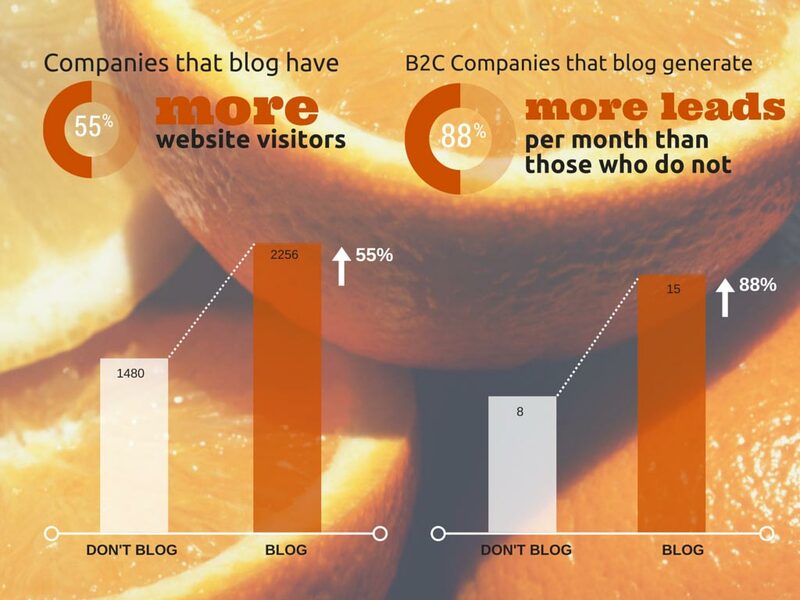 This means blogging is increasingly important for building relationships, especially with young customers. The best part about blogging is it only costs you time. Your office is full of banking experts that have a lot to say! Why not have your staff share their valuable knowledge online? 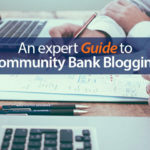 First Bank & Trust is winning with community bank marketing through the use of their blog. They write helpful articles almost once per week on topics their customers can easily digest, and post them on their website. FB&T typically targets commercial customers with their content, but your Community Bank can focus on any type of customer. 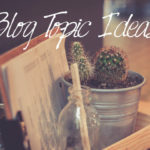 Some recent blog examples are “Tips for Applying for a Small Business Loan” and “6 Pieces of Business Wisdom Every New Entrepreneur Should Know.” These articles help educate current and prospective customers, while building strong relationships online (which is increasingly important!). In addition, their blog helps show their company’s ‘personality.’ Banking doesn’t have to be boring! A little side note – FB&T re-posts their blogs to social media to drive traffic and engagement too. 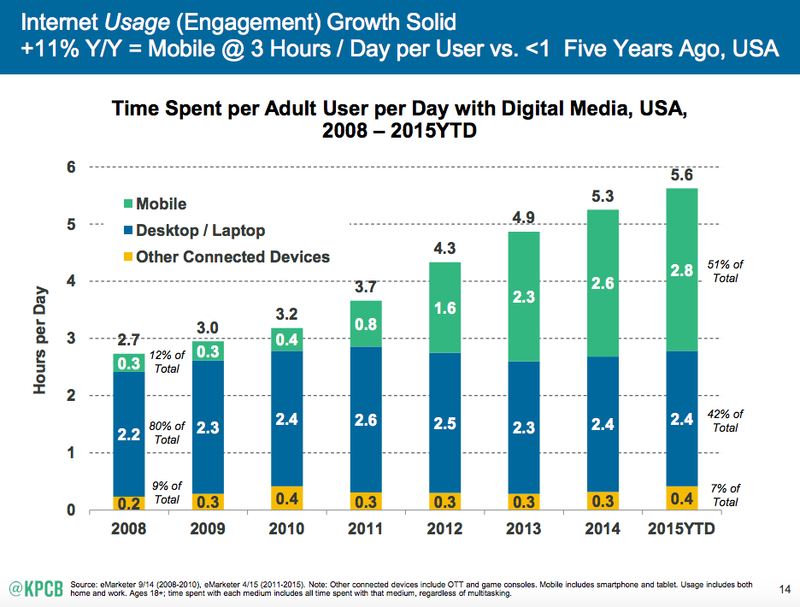 Did you know more people are now using the internet on a mobile device than a desktop computer? You might need to read that again to fully sink in. In plain terms if your audience is having difficulty interacting with your bank’s website on a mobile device, they will quickly leave and find that information somewhere else. 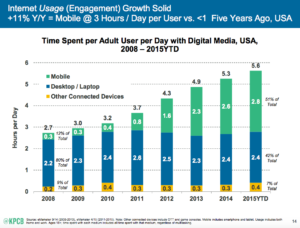 This means it’s now fundamental to success to have a mobile-friendly website. Does Your Bank's Website Look Older than the Owners? Our honest, objective, professional reviews help businesses start good conversations about getting more from their websites and online marketing.